1Department of electrical engineering, faculty of engineering, azarbaijan shahid madani university, Tabriz, Iran. 2department of electrical engineering, faculty of engineering, azarbaijan shahid madani university, Tabriz, Iran. 3Department of Electrical Engineering ,Tabriz Branch, Islamic Azad University, Tabriz, Iran. Renewable energy systemswill bewidespread power sources in future years due to their sustainability and clean nature.Due to intermittent nature of many renewable energy resources (such as wind, photovoltaic and etc. ),their hybrid usage are preferred. One of the most important issues related to hybrid renewable energy systemsis finding the optimal size of their parts to utilize them efficiently and economically. There are several methods for optimal sizing of hybrid renewable energy systems, reported in many articles, containing their own merits and demerits.The current paper reviewed such methodologies and compared them using some appropriate indicators. 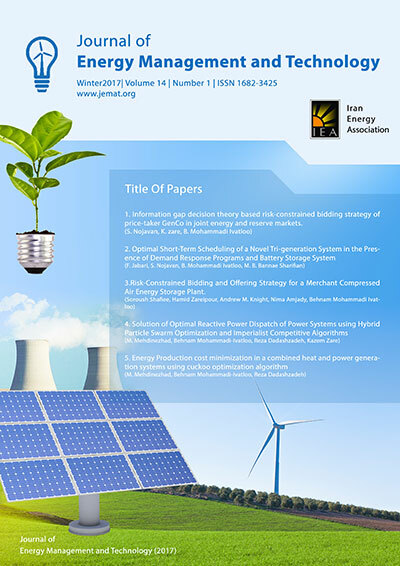 This paper helps the system designers to select the appropriate sizing method for their hybrid renewable energy systems. Nowadays electrical energy is one of the most necessary requirements of mankind and is a vital factor for social and economic developments [1-3].Due to increase in population, fast urbanization, rapid industrialization and increased energy consumption, the demand for electricity is increasing.